The week of November 11 brought fifteen(!) new books and journals to Winkelman Library. 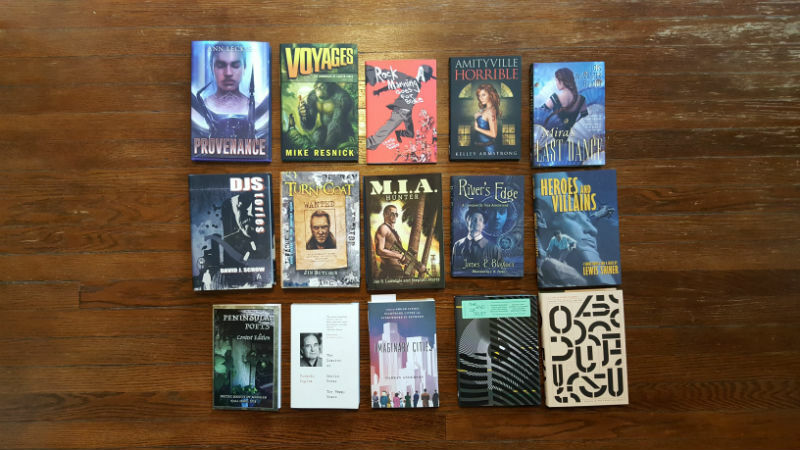 The top two rows are the contents of the most recent Grab Bag from Subterranean Press, one of the premiere publishers of special editions of genre fiction. The bottom row includes, from left, the latest issue of Peninsula Poets; The Diaries of Emilio Renzi: The Happy Years, which is the latest book from my subscription to Restless Books; Imaginary Cities by Darran Anderson, which I picked up at Books and Mortar; issue 54 of McSweeney’s, and All That Is Evident Is Suspect: Readings from the Oulipo 1963 – 2018, published by McSweeney’s. All this should keep me busy for the next week or so. The books in this photo are #217 to 231 in the 2018 Reading List post, where I have included links for ordering and author information.